This entry was posted in climate, creationism, New Zealand, politics, SciBlogs, science and tagged fluoridation, fluoride, Fluoride Free Hamilton, New Zealand, SciBlogs, Water fluoridation. Bookmark the permalink. So let me get this straight about the methodology of the science deniers…. The nutters cast their net far and wide and manage to scrape together three (count ’em 3!!!!) dentists that are telling them what they want to hear. Then they annoint those lonely three with the title of being “informed” ’cause….y’know. 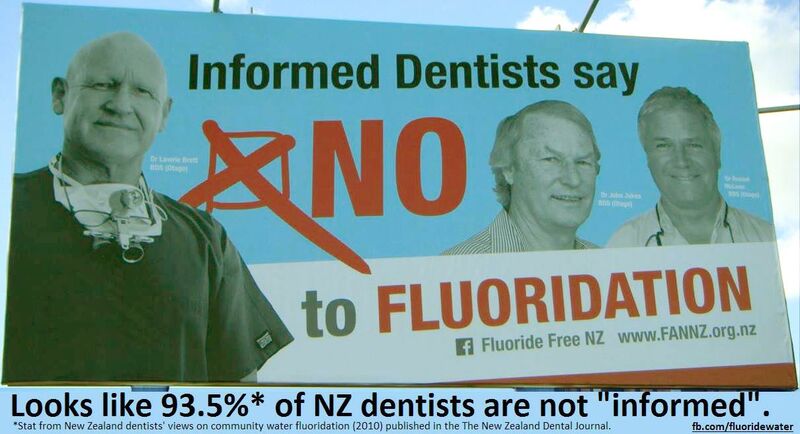 Meanwhile, a look at all the rest of the dentists in NZ reveals crushingly overwhelming support for fluoridation. This sounds very, very familiar somehow. What’s up with that? All good. Andrew originally showed me that paper. Far and wide indeed. One from Auckland, one in Wellington, and another in Dunedin. Yes, I see the nutters are heavily promoting is story on Twitter. What is your motive for promoting it, Andy?